September | 2014 | Extollagy! The aim of these trips is to move around the island on which I live, getting a sense of the lie of its land. At all times I am alert to two things: the underlying geology, (especially as it affects the shape of the landscape on the surface); and the resulting shifts in human things: buildings, history, culture. It’s the calibration between the two that interests me. The aim is to re-enchant our relationship with and understanding of the land beneath us: in an age of identikit towns and sat navs, to reveal the power and specifity of place — and to reveal the human element in that grand and elemental story. And also to explain: this is how this island fits together, and what makes Humberside different to Caithness, Dorset different to Cumbria. To turn places into Places. This trip over to Scotland — at a remarkable, if rather anticlimactic, point in its history — is a case in point, and also a challenge. I was ignorant, I realise, of basic things like Scottish counties and major rivers (how is Angus different from Argyll, the Don from the Dee? ), and daunted by the scale of the landscape. There’s a lot of Place up here. And I’m doing more or less what I did with Northern England a week or two ago: casing the joint, getting a sense of the shape of things, with lots of research combined with a certain amount of gut-feel *that’s* where I’m going today. The border is not a specific point in the landscape, like the Pyrenees in Spain; but the Borders are well named. Underneath this entire region lies a great mass of Carboniferous sandstone, separating the Pennines from the Southern Uplands, great and linking the wide mouth that is the Firth of Forth — one of the geological structural keys to the whole island — and the lesser one of the Tweed. The geology of the Borders seperates, but does so gradually, creating a region with an identity in its own right; and arguably the existence of uplands from the north Pennines to the Midland Valley is one of the reasons for the survival of Scotland as an entity. After all, this is not a large island, and England has ultimately been richer and more powerful: over centuries, in many parts of the world, this has resulted in the extinguishing of smaller polities. Yet Scotland is unquestionably a nation, and not (like Wales, until recently) a nation whose identity depends on cultural identity alone: this is a nation that even at the height of the Britain/UK project retained its own institutions, its own laws, and whose constitutional relationship to the whole depended on a deal-between-monarchs that is very much not the submission of poorer northern to richer southern partner. That is, it is a nation institutionally, too, and has never ceased to be so. Perhaps that is why things change as soon as you cross the border. The little ashlar bungalows and big Grecian hilltop monuments or public-spirited institutional buildings of Coldstream could just as easily be in Morayshire or Galloway, and would look weirdly foreign even 50 miles south. 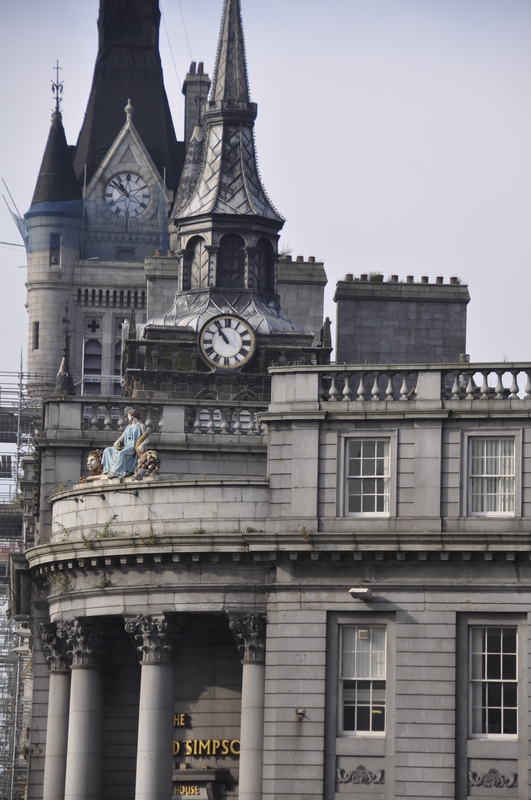 There are continuities, of course, not only of architectural style but of regional specifics: those little ashlar bungalows are a case in point, prevalent in the Northumberland Cheviots, too; Newcastle, with its Grecian Grey monument and grand sandstone streets is on the way to being a Scottish city. As well as being on the way to actual Scottish cities. They mark out the elements of a series of things architectural that make the Scottish landscape distinct from the English one. I haven’t fully got to grips with all of them yet, but certainly some can be seen everywhere from Thurso to Forfar. The medieval and Roman dimensions of the landscape, so often the visible root of everything in England, are often absent and even when present not nearly as obvious: instead, it is the C17 and C18 from which the landscape apparently derives itself. Places are often planned: they are often planned in England, too, but because the plans there were laid out in the C10-C12 they have had time for each structure on each plot to be rebuilt several times over, and the underlying directed nature of a settlement thus becomes less explicit to the eye. Perhaps they were always slightly less ordered in any case. There is a bigger range of grand public buildings, institutions, collective projects created for the good of all (or at least of their members), than even in the north of England, and they are Neoclassical, a rare style to the south. A bigger range of places of worship, too; of course there are nonconformist chapels aplenty in England but one is rarely in any architectural doubt that we have an established church. In Scotland, the architecture of one branch of Christianity does not dominate, or provide the tap root of places, in the simple way it does in England: churches crop up in (to an Englishman odd) places. 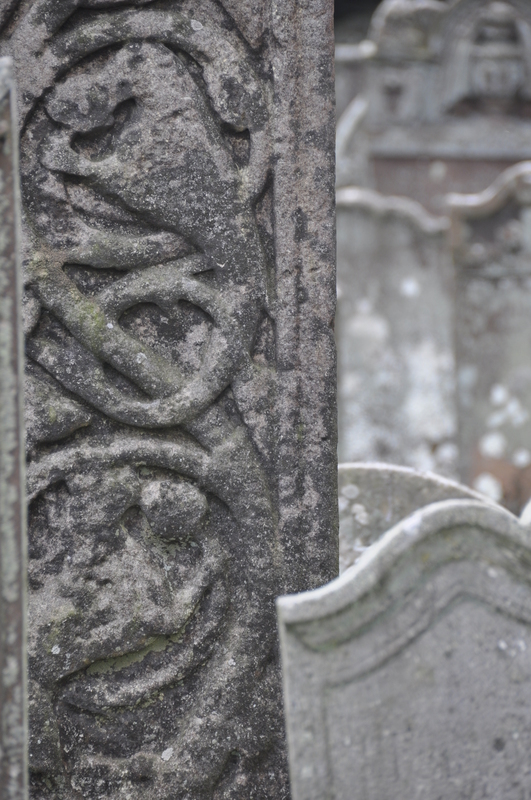 Graveyards are often set aside from them, cropping up as plots on the edge of cities or by the roadside in rural areas. This may be a pattern with old roots: where the churches are ancient, they are in non-nucleated sites in the middle of groups of farms, or outside the centre of the modern settlement. And finally, within Scotland there’s a separation between two landscapes: the Scotland in which scattered crofts overlook the seas, and the Scotland of scattered farms set inland around kirktowns and chapel towns. (There’s a grand imperial city and post-industrial Scotland too, but not particularly part of this trip. And there’s more, but that will do for now). And everything is made of sandstone and granite. Indeed there is so much of the former that one might begin to tire of it. A shame, because on closer examination the variations and uses of these stones is one of the great qualities of this built landscape, and its most immediate debt to the natural one. 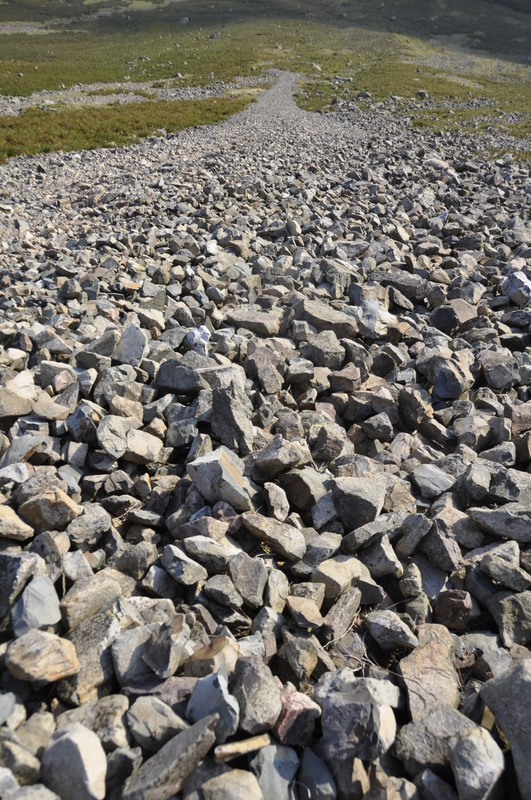 The purple-brown sandstones of Angus are different from the sand-coloured ones of Morayshire; a stone of one colour will be used as decorative dressing in a build made of stone of another. These variations, for example along the north coast of Moray and Aberdeenshire, often move subtly in step with that of the underlying geology, a sequence marvellous to move through. Indeed, this whole country is made of sandstone and granite. That’s a massive generalisation, of course, but in Scotland the English story of a generic sandstone ‘midland’ around which everything else can be seen to fit is turned around. The sandstones of the Midland Valley (and elsewhere) are the key to the country’s prosperity and, arguably, statehood: here are Glasgow and Edinburgh, for example. 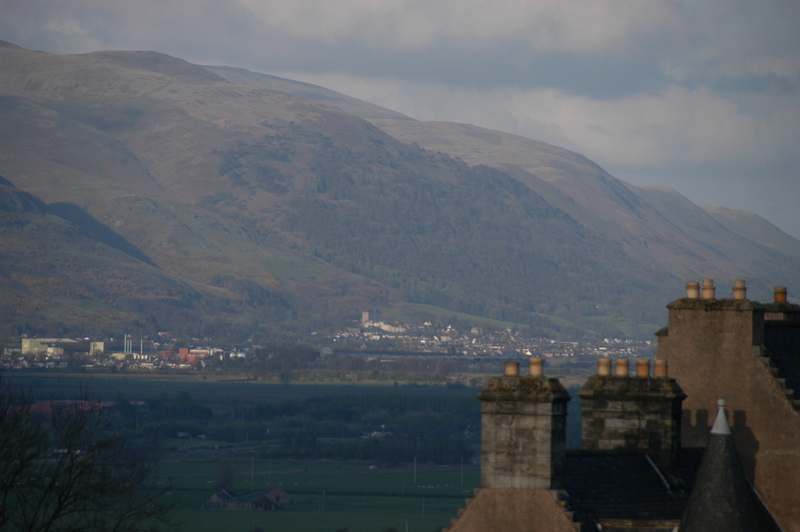 North of this are the highlands, to the south the Southern Uplands. Here the story is unendingly complex (and exciting), but igneous rocks play a vital role in it: witness the great massif of Cairngorm. Indeed the great lava whins that erupt throughout the country play a key role in giving even the most verdant arable landscape an edge of drama, and making Stirling and Edinburgh such impregnable seats of power. That’s the big picture, as it currently seems to me. What specifics have stood out from this 5-day recce of the country’s eastern side, from Edinburgh to Caithness and back? Firstly, I’d barely clocked neither Aberdeenshire nor the area immediately east and north of Inverness before, but these are heartlands from the Pictish era onwards, and even in prehistory they veer from the reassuringly familiar — the prevalence of long mounds, henges, round barrows and hillforts suggests that the concept of Britain might have been understood all those thousands of years ago — to the fascinatingly new. 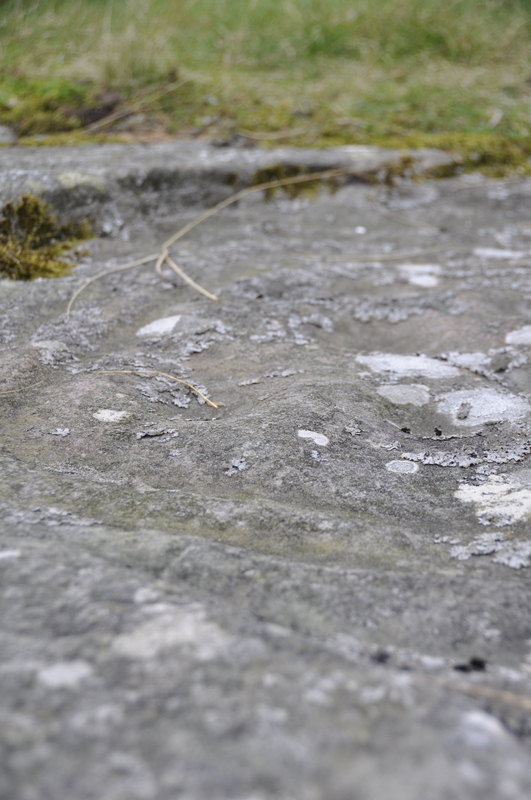 The result includes Pictish carved stones, of course, but also recumbent stone circles (only one stone is recumbent, but it’s an important one): both of which are very geographically specific phenomena. With regard to the latter, the whole area around Inveruie in Aberdeenshire is one of this island’s great sacred landscapes, doing everything such Places should: react to the water, the meeting of Don and Euie in a great fertile bowl; react to mountains, the great peak of Bennarchie; mark out and sacralise the more fertile land, in twenty or more stone circles scattered on the hills around a central henge; reveal internal continuities and stratigraphies, such as in the reuse of stone circles as later cairns or the recarving of individual standing stones by the Picts, several millennia later, but still ancient to us; and respond to the rocks beneath. Easter Aquhorthes was a gem: the great one-off lump of pink granite almost glistening in the evening light; the curious quartzite skin on the moon-facing main recumbent rock very suggestive. The monuments of Caithness were almost as impressive: here the epicentre looks north, as if Caithness was a suburb of Orkney Mainland, only attached to the boring old Continent to the south by misfortune; and geologically, both are part of the same ancient sandstone basin. To crawl inside the round mound at Camster is an experience not to be forgotten, with thousaands of tonnes of dry stone powered and domed above one. Medieval monuments were intriguing, too. Elgin cathedral as serious a work as any in Scotland, telling the same stylistic story: Romanesque and Early English a highly sophisticated offshoot of the latest practise in Northern England; from the mid-C14 everything changes and England is conscpicously ignored. As we ignore it: the chapter house, visually 1390 but laid out in the C13, is not in our ‘grand narrative’ of polygonal chapter houses, which is bonkers. Montrose cathedral an intriguing demonstration of how a decent designer with few resources could use a few early C13 bangs and whistles, all of them as far as I can see derived ultimately from Lincoln and York — to good effect. As for later stuff, every town and village is stuffed with it, and the better-off the area, the more of it there is. 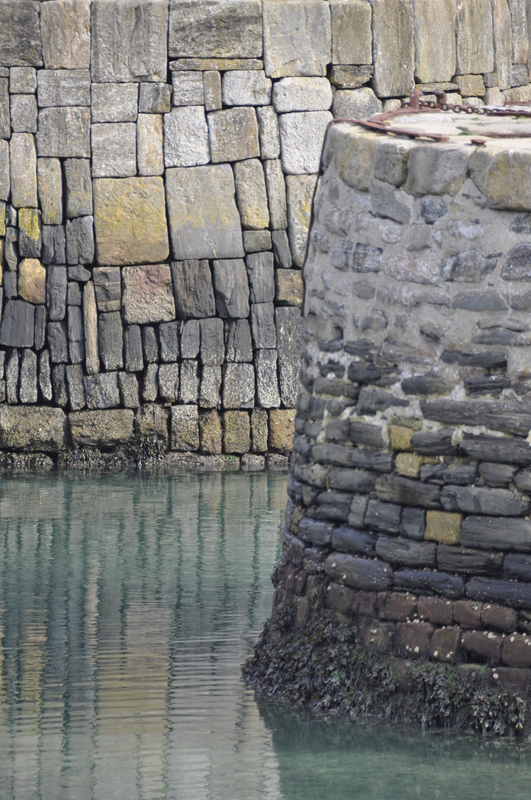 But for responses to local stone, there is little in Britain to beat the sequence of fishing villages that run along the north coast into Banffshire, a geological map on a stunning coastline; or Aberdeen, glistening with mica, a city of granite, cold, inward looking — as Bath is a city of Jurassic limestone, warm and inviting. 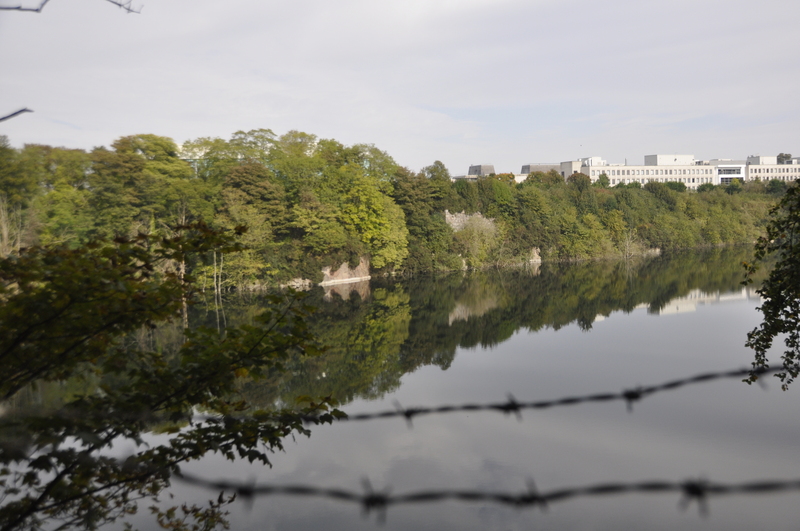 The great hole of Rubislaw from which the city was lifted, now a hidden lake surrounded by offices and high fences, was a sight in itself. 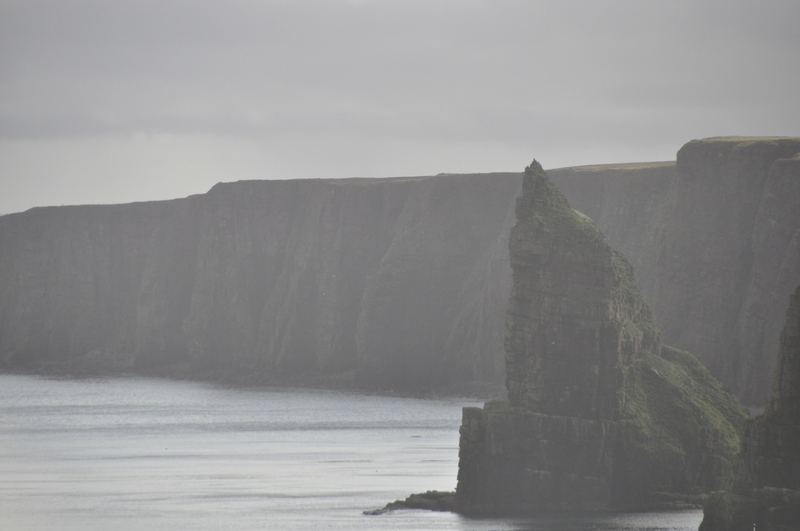 Then there are the places that struck for their unexpectedness: the curious country around Caithness, a brief 10 miles of arable struck with tooth-like sandstone slates after decades of highland and peat bog. Fraserburgh, a functioning fishing town in which Tagalog and Doric seem to be the two main langauges, the latter only slightly easier to comperehend than the former. And much, much more. Some of which is on Facebook, because I’m running out of time. The next book is about landscapes, really, but I find myself itching to get down the highlights from some of the more striking buildings I discovered during last week’s 1500-mile grand tour through Yorkshire, County Durham, Northumberland, the Borders, Cumbria and Lancashire. The aim at all times was to discover the unfamiliar, and the landscape-rooted, but these included some architectural/art historical gems of the medieval (and other) world/s. The first of these was Horton-in-Ribblesthorpe: a classic dark, bleak Dale-land/Pennine church, externally all Perp but with C12 arcades so simple they could as easily have been poor man’s C17. 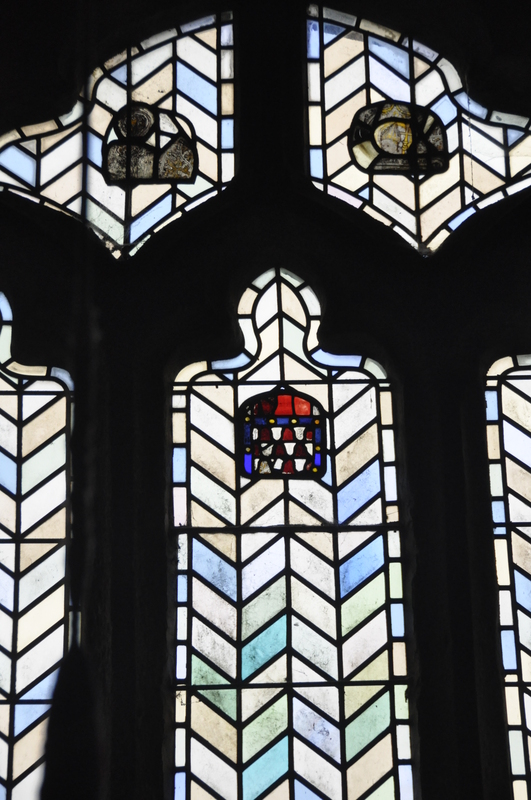 The highlight here was three tiny pieces of late medieval glass, high up in the west window and barely visible, yet striking in their implications: the head of the Virgin Mary; the head of Thomas Becket; the arms of Jervaulx abbey. These are arguably the two most aggressively proscribed images of the 1530s/40s, combined with the arms of a dissolved institution; not only that, but to retain just the heads — the part of an image most thoroughly focused on by iconoclasts, and equally a part most easy to slip from some shattered pile and spirit away — is a remarkable act; when combined with the badge of the dissolved monastery, one that surely has purpose. There was something very moving about the unknown backstory of these (apparently carefully preserved) fragments: one is reminded that here we are in the heartland of the anti-Reformation Pilgrimage of Grace. 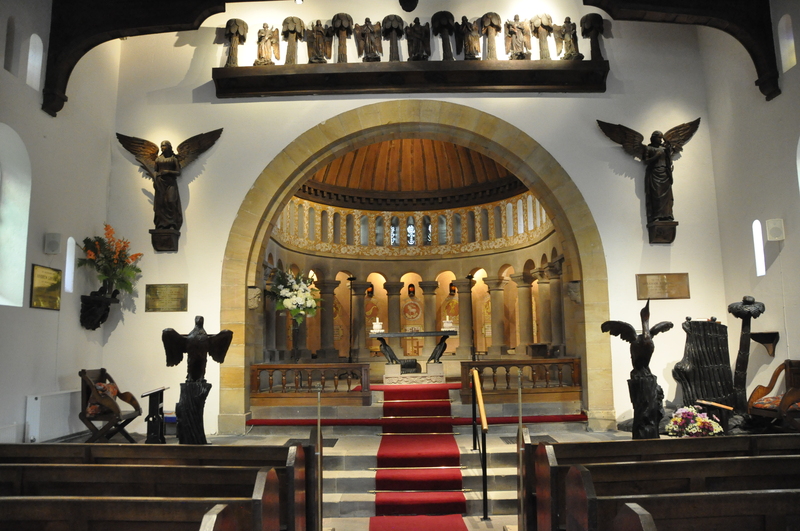 Lastingham, nestled in a verdant valley of the North York Moors, has strong connections to the early church and one of the less-known monuments to the remarkable years of the 1070s and 1080s, the earliest decades of the Romanesque in England. 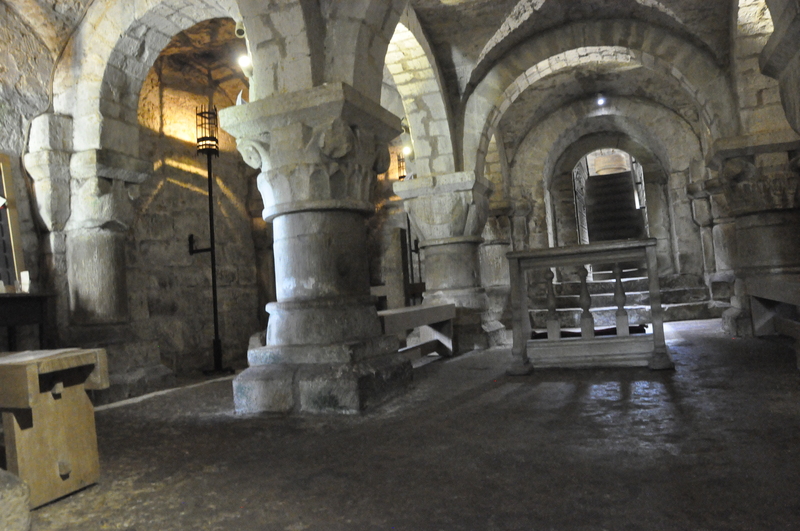 The highlight of this church is the extraordinary crypt, presumably associated with the cult of St Cedd, and one of the most significant monuments of a couple of decades from which, outside the cathedrals, very little survives. It is in a brusque early Romanesque rather reminiscent of the early castle chapel at Durham, and like that building, the simplicity and heaviness is combined with some determined attempts at decorative variety: in this case, every capital is different, and one of them is surely one of the earliest dated cushion capitals in the country. Upstairs the remarkably effective ‘restoration’ by Pearson preserves intact a top-rate Norman apse but seems to occlude the archaeological evidence for whether the enormous groin vaults are based on any evidence or not. All in all this was a small-but-rather-fine priory whose development, complete with crypt, halted in mid-build, leaving a structure which only has the stump of a nave to this very day. I’m going to pass over Reivaulx (and Jervaulx, and Middleham) — but mention must be made of the chapter-house at the former famous church, a kind of miniature apsidal basilica perhaps associated with the cult of St Ailred: an odd place for a shrine, but he was buried there, and there surely can’t be another reason for the provision of an ambulatory? Perhaps the insertion of a little shrine-setting to the north of the central door in the C13 was an attempt to provide pilgrim access without having the hoi-polloi troop through the chapter-house itself? Another moving Dissolution-moment here, too: axe-marks on the stumps of the columns. I wondered offhand whether there was another religious building in Europe closer in plan to a C3BC Buddhist caitya hall. Which was also a gathering-place for monks, if rather more devotional in function. Dod’s Law, Northumberland is not a church: it is a pair of iron age hillforts on a hilltop overlooking the distant domes of the Cheviots, but it is hard to avoid the conclusion that there is something ritualistic or religious about the remarkable, probably Bronze Age, rock-art — like graphic maps, or Native Australian images of Dreamtime landscapes — laid out painstakingly on the great blocks of Fell Sandstone that litter the site. 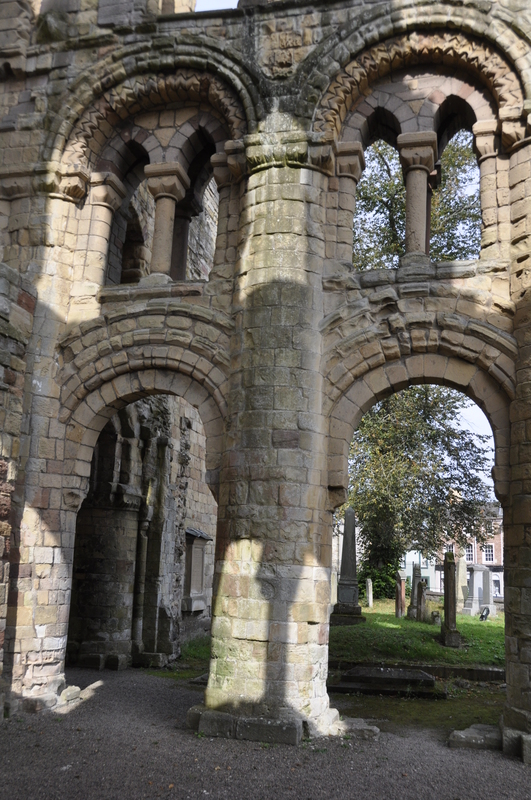 Next up, two great abbeys close to the border, in southern Scotland: Kelso and Jedburgh. Both are testament to a series of generalisations one can (perhaps) make about medieval Scottish architecture: that these buildings are not large by English standards, and until the C15 even the greatest of them lack the high stone vaults that were standard to the south by 1200; that by 1400 they have stylistically gone their own sweet way, almost pointedly ignoring developments in England — and that c.1150-1250 a great wave of building and rebuilding swept this country, resulting in structures of such inventiveness and sophistication that the story of architecture in the British Isles in those crucial years is incomplete without them. Witness the remarkable westwork, a richly-arcaded mini-Ely, at Kelso; and the handsome Giant Order, part of a story which is otherwise restricted entirely to southern England (Tewkesbury, Oxford, Romsey, ?Reading), in the east end at Jedburgh. From here to Cumbria there is a B-road of spectacular beauty and emptiness, snaking for 30-50 miles through mountain fell and dales running with peat-black streams, with barely a hint of village or farm. Then, barely in England, and still in a landscape untouched by signs of tourism or Leisure Activities, one comes to Bewcastle. This is a tiny church at the centre of a cluster of farms, a pre- high medieval kind of setting, preserving much that was normal before the invention of the ‘village’. This is a place of astonishing silence, but don’t be deceived: enclosing the ruined Border castle and the churchyard alike is the earthwork of a major Roman fort, with a road connecting back to Hadrian’s Wall. 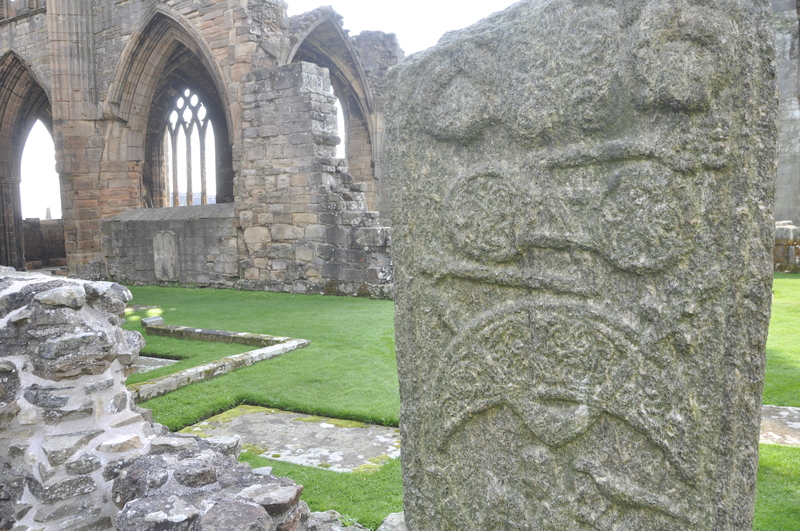 In the C7/C8, therefore, this could easily have been a nodal point in a post-Roman, Christianised landscape — explaining the presence, still standing proud in the open air among the tombstones, of one of the major works of the era of the Lindisfarne gospels, Cuthbert and Jarrow: a mighty, headless cross, covered in Runic inscriptions, well-carved late Roman decorative scrolls, and figures of such hieratic clarity they could be by Eric Gill, rather an anonymous craftsman of 1300 years ago. This is partly a commemorative monument, as the inscriptions demonstrate; the great flock of C18 and later headstones from which it rises, all their names pointing optimistically east, powerfully demonstrative of the continuance in the Christian tradition of the ‘commemorative standing stone’. Then, firmly back in a more recognisable England, the extraordinary church built at Wreay south of Carlisle by local gentrywoman Sarah Losh in 1842. Losh guided every detail of this building (and the associated landscape of school house, mortuary enclosure, well-heads and funerary chapels, as well as a few domestic buildings), constructed entirely by local craftsmen with local materials. The result, infused by symbolic imagery drawn from personal, Christian and non-Christian sources alike, and powerfully informed by the early C19 understanding of early Christian art, is a testament to a convincing and unique aesthetic vision. In other words, this was a revelation: there is a moment of spiritually-infused formal originality in the eC19, most purely embodied in the post-Blakean work of Palmer and his Ancients, arguably present in Turner, but not as far as I know expressed architecturally in any other religious building (Watts managed it later). It should be one of the most famous churches in the land: Losh as a kind of Victorian architectural Kate Bush (or Sir John Soane, for like Bush this is an art that transcends gender, will arguably being suffused by it). West of here, in the great ice-scoured post-Volcano of the Lakes, the peak at Pike of Stickle has hanging down its vertiginous rampart a colossal scree slope that appears to be almost entirely man made. Though this entire upland was a terrifying third-world desert to medieval people, it was a place of great human significance in the late Neolithic, with a plethora of henge monuments all lying within 20 miles or so. And here, at the top of an often frost-and rain-shattered peak, stone axes were knapped from the landscape in such number and traded with such keenness that their products can be seen in many parts of Europe, and the axes deemed to have *failed* produced in such number that 100s of thousands, perhaps millions, still litter the hillside to this day, their sharp edges and knap-fractures intact. Pike of Stickle has a special status in the great narrative of the anthropocene: just as this is when people first began to shift stones around so as to make permanent structures, this is also the first time that the products of a single place were spead so far and wide that the result is at once often found and entirely divorced from its geological origin. For the hand-axes of Stickle Pike or Grimes Graves, read Barnack limestone, York paving slabs, Welsh roofing slates, Portland stone, Italian marble, and every mineral product of the modern third-world mine that goes onto be spread around the world in laptops and handsets. On to Furness, for more revelations. Here is a landscape on the way to nowhere, but also a mini-country of it is own, with its historic towns (Ulverston), dramatic industrial sandstone capital-city (Barrow), moors, wetlands and beaches, all overlooked by lowering Lakeland peaks. First there is Cartmel, not quite as eccentric a smaller priory church as Dorchester or Oxford but on the way, and with excellent glass and a remarkable C14 tomb to boot; and then there is Cistercian Furness abbey itself. I had expected this building to be somewhat provincial, but I couldn’t have been more wrong. Of course, like so many of its peers, it is in a beguiling landscape, a valley near (but not in) a medieval ‘desert’, but presumably bearing a comparable relationship to the centre of serious power at Lancaster as Jervaulx does to Middleham, Rievaulx to Pickering or Helmsley (? ), and Tintern to the Marcher lordships (and, further back, Lindisfarne does to Banburgh). 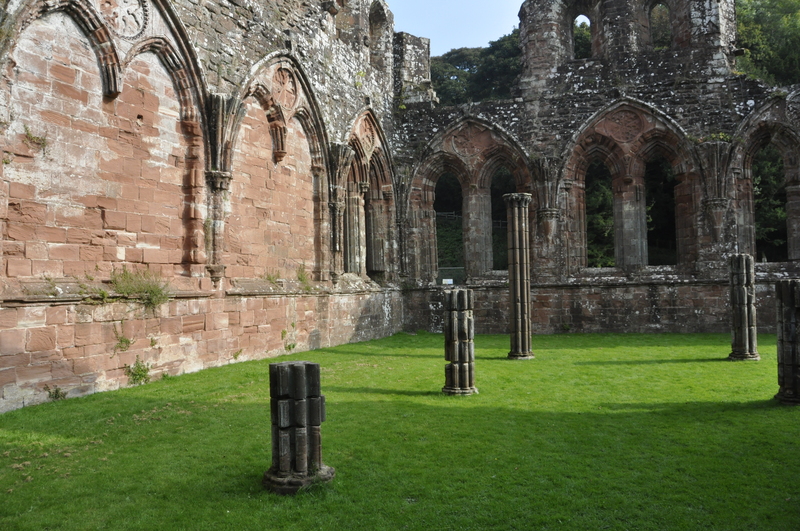 Like our Border abbeys, and indeed Lanercost to the north, it includes major examples of late C12 work, as well as the C15 stump of a prodigious western tower and a cliff-like east end, and a series of conventual/precinctual buildings of the later C12 that really should be better known. The edge-of-precinct chapel and infirmary extension capture the mannered quality of some late EE/early Dec work, otherwise associated with very cosmopolitan buildings – Bishop Burnell at Wells and Acton Burnell, bishop Aigueblanche at Hereford. And the chapter-house, even in its current roofless and vaultless state, is extraordinary. This was once a hall-‘church’, its three rows of high stone vaults supported on vertiginously slender columns, its edges a series of mighty blank-tracery panels, like the York chapter-house vestibule blank ‘arcade’ filling an entire wall. Polygonal chapter houses are knockout, of course, and some of the more traditional rectilinear examples of the Romanesque era (Bristol is the best-preserved) clearly were, too. But I haven’t come across a Gothic-era rectilinear-planned chapter house in England of anything approaching this beauty and ambition. Wow.